Learn about our proven process for how to paint oak cabinets and hide the grain to achieve a completely smooth and professional finish. I’ve talked about how to paint a room, my favorite room painting essentials, and some of my go-to paint colors, and today I’m going to share how we painted our 80s orange oak cabinets to achieve a custom-cabinetry finish. Originally Published on February 16, 2014. Last updated March 4, 2019. I will be very frank up front: this project was not a quick, or an easy one. We do not recommend it for a first DIY project. But for an experienced DIYer, it may just be the answer to having your dream kitchen within your budget. If you choose this route, you are making a major commitment. Should you choose to do it all at once, you will probably need to take a week off. If you choose weekends, it will probably take you a couple of months (all of this depends on your pace and the size of your kitchen, of course. I am referencing a leisurely pace and a similarly sized kitchen to ours). I certainly don’t mean to scare you off. If I bought a house tomorrow that had orange oak, I would do it all again! In my opinion, the results definitely validated the work. I spent many months reading tutorial after tutorial and forum after forum. Eventually, after I tested many products and processes (half a dozen wood/grain fillers, oil-based paints, latex-based paints, lacquers, even spray paint!) and created a bunch of test swatches, I was happiest with the results of the process I’m about to share with you. I decided to go my own way and I came up with the process in this tutorial. I hope that all of my research will help you as much as it helped me! 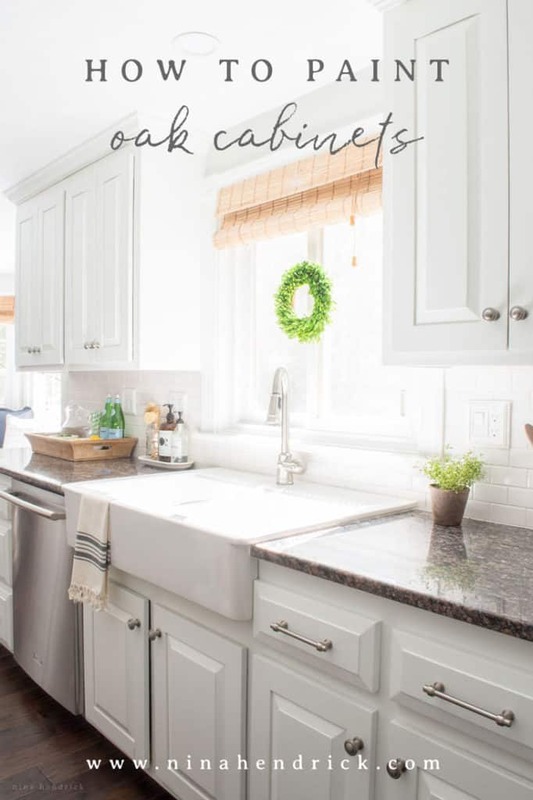 When I first wrote this post several years ago, I knew from my own research that there weren’t a lot of comprehensive resources on the topic of how to paint oak cabinets and hide the grain. There weren’t even many on how to paint kitchen cabinets in general! So, I set out to create one. It wasn’t complete, and frankly, I feel like it’s too much information for one single blog post. This post now provides a summary of the project, as a companion to the e-book. If you are looking for reasoning, how much we spent, as well as an in-depth explanation of what did and didn’t work, make sure you check out the e-book. The following post will provide you will all of the materials for quick reference, as well as a summary of the steps. How Do You Hide the Grain on Painted Oak Cabinets? I go through that process step-by-step in the tutorial below. Before we dive in, there’s one thing I really want to emphasize. I truly feel that filling in the grain is what made this project so successful. I know that step is the hardest. However, on our test pieces that didn’t have filler we were left with black grain even after several coats. Notes: We chose and recommended the products we felt were best through research and trial-and-error. This was the best process for us, but that does not mean we can guarantee you will be able to achieve the very same results, or that you will be happy with your results. We did many test and practice runs before we attempted the main project. My husband and I are experienced at painting, although we have never done this particular project. In our opinion, it’s not a beginner’s project. If you are just starting out at DIY, we recommend that you speak to an experienced professional about painting your cabinets. As with all projects, we recommend that you always use proper safety equipment and proper ventilation for paint projects. Some of the links below are affiliate links. Read my disclosure here for more information. We had additions to this project that you may or may not have to worry about. These did factor into my estimate of this project taking five days in total. We had to add trim pieces to the doors to accommodate the new hidden hinges. Our previous shelves were warped fiberboard and were covered in shelf-liner, so we opted to replace them and built high-quality cabinet-grade plywood shelves. We had to do some carpentry to strengthen the sink cabinet to hold our new Farmhouse sink. Some of the cabinets were damaged and sagging (rotted), so we had to reinforce them. They are not solid wood all of the way through and are made partially from fiberboard. Once we accomplished all of these tasks, we could finally start on the painting process. However, the prep work is probably 95% of the process. Once you get to the painting, it moves very quickly! Unfortunately, you’re in for a long process before that happy step. I promise it’s all worth it in the end! How Do I Paint My Oak Cabinets? What’s the best paint for painting oak kitchen cabinets? This was a very important part of the process for me. As I mentioned above, a lot of research went into my decision to use a paint sprayer and Insl-X Cabinet Coat Enamel (they did not sponsor this post in any way). Insl-X Cabinet Coat is an acrylic water-based enamel. It was already pretty thin, but through trial and error, we determined that the best results were achieved with our paint sprayer when we diluted it 8% with distilled dater. We are being very specific about distilled water. We tried it with tap water and the minerals in our water reacted negatively to make the paint discolor and run. To achieve the 8%, that is where your measuring cup (and probably a calculator) will come in handy! Make sure to mix it well. My favorite aspect of this paint, and the reason why I recommend it so highly is that it has really great self-leveling properties. It has provided the closest thing I’ve seen to a cabinet factory finish without being the real thing. It also has not chipped so far within the five years since the cabinets have been painted (with the exception of one spot where the cabinet was rotted beforehand). You can read details from the manufacturer here. Why did you choose DryDex? Did you try [Insert Product Name] instead? 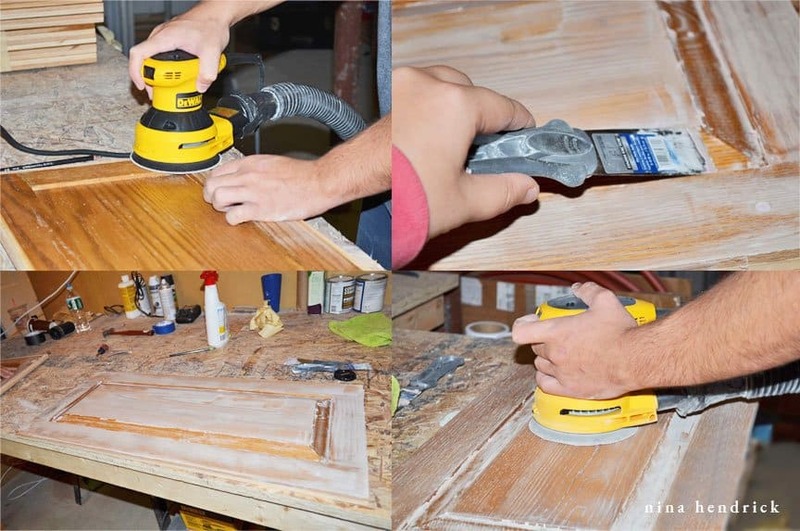 We tried several products, including many actual wood and grain fillers, but we got the best results with the Drydex mixed with a little of the dust that remained on the cabinets from the first sanding. I know it sounds strange, but it worked great. With that being said, please know that this isn’t a magic product. You’ll still see an extremely subtle grain at certain angles on the finished product, just enough grain to know it is wood under there. We weren’t aiming for a glasslike finish. We just knew from previous experiences painting oak that the grain detail sometimes remains black because the paint can’t make it into the tiny cracks. We definitely wanted to avoid grain showing through completely, and this solved our problem! Which paint sprayer would you recommend for painting kitchen cabinets? No matter which paint sprayer you choose, I highly recommend using some type of paint sprayer. We have gone back and forth and tried a few different paint sprayers during the years since we completed this project. We struggled with some “orange peel” (air bubbles in the paint) in the early steps of this project but were able to correct it with the proper dilution. At this point, I would recommend the updated version of the original paint sprayer. 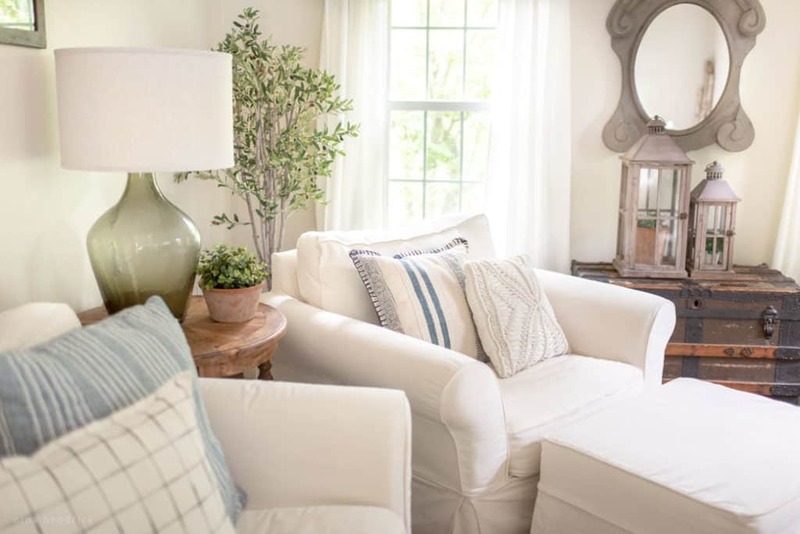 What are your thoughts on Benjamin Moore Advance? We have used Benjamin Moore Advance for many projects since this one, including all of the trim in our home and some built-ins. It’s a great product. 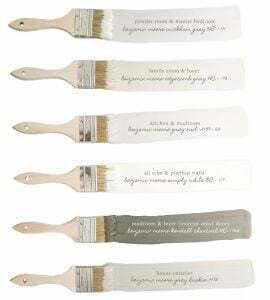 If you are brushing on your paint, do keep in mind that you may be able to see the slightest of brushstrokes. I still feel that the Cabinet Coat is was the right choice for this project. What color did you choose? Can I choose colors other than white? For color, I chose not to tint it, which I now regret. Since it’s a Benjamin Moore product, they will tint it any color that you wish. If I could do it all over again, I would tint it BM Simply White to match our trim, ceilings, and other built-ins. In its natural state, Insl-X Cabinet Coat seems to have an ever-so-slight blue undertone. Keep this in mind if you are hoping for a warmer color. It’s best to talk to your local paint store expert and see what they recommend. Make sure you gather everything from the list above. Trust me that you won’t be wanting to make a trip to the hardware store part way through the project! I mean everything. There will be a lot of dust created! You will want to completely clean out your cabinets, junk drawers, everything. This was a good opportunity for me to employ some tough-love and get rid of the kitchen utensils and items that have never been used. This process alone can take you quite a while, depending on how disorganized you are (and I was very disorganized!). If you’re saving hardware, make sure to place it in baggies or envelopes with corresponding numbers. We were replacing the brass/porcelain hardware, so we skipped this step. However, we still made sure to number our doors and drawers, since we have custom-built cabinetry (built in place versus individual pre-built cabinets) each door is slightly different in size. No matter what, it’s a good idea to number everything, just in case. You’ll want to make sure that there’s no dust or dirt in or on any of the cabinets because it will impact your eventual finish. Vacuum everything. You can probably use your regular vacuum for this part if you wish. Then wipe down with TSP substitute. Since we were living in the house while renovating, we wanted to avoid actual TSP. The substitute is a good alternative, but it is still a chemical, so make sure to have proper ventilation while you use it. Remove All of the Appliances. To get an all-over finish, it’s best to remove your appliances and put them out of harm’s way. This means out of the room completely. We tried to delay this step as long as possible to keep our kitchen functional. As mentioned in Step 2, there will be A LOT of dust… and also overspray. You’ll want to seal off every opening to other rooms, and completely cover your floors and walls with plastic. You’ll also want to protect your countertops. Anything that you don’t want permanent specks of white paint on, cover it up! You’ll probably end up with a plastic room by the time you’re done! Since we have the textured plaster ceiling, we had to attach the plastic sheeting to the ceiling using Gorilla Tape, since the painter’s tape wouldn’t hold. We attached our orbital sander to our shop vac to try to minimize the dust impact on the room as a whole. We focused on damaged areas (there were many, especially under the old hinges and around the sink). It’s okay to leave some dust behind on the cabinet faces, since it’s actually helpful in the next step. You only need a thin layer of DryDex, just enough to cover the grain. If you apply too much, you will just create more sanding for yourself in the next step (speaking from experience!). Areas with damage or screw holes (like in our case, where the exposed hinges used to be) may require a light second coat of DryDex. Allow for the recommended drying time in between sanding and coats, or else it will pill up and become ineffective. Use your orbital sander attached to your shop vac. This time you don’t want to leave any dust behind whatsoever. Go around with a tack cloth and wipe everything down. Important! Do not use a damp cloth. It will remove the Drydex from the grain! You’re getting there! This is much less of a job if you are only doing your cabinet faces and ends. We opted to paint the inside of the cabinets as well (there were a lot of stains and damage) so I used a mini roller and a brush and Kilz Original Primer to get the job done. It’s important to use an oil-based primer because of the tannin in the oak. This is an orange-y brown oil that will bleed through if you use a water-based primer. We were told that the Cabinet Coat included primer. It does, which works out great on maple or pine, but on our oak test swatch we ended up with swirls of tannin without the primer. Do you love sanding yet? By this point, sanding is your best friend (HA!). Sand it all down lightly by hand, because the orbital sander will remove too much of the primer. I recommend a sanding block. Trust me, throughout this project, I tested all options. The sanding block is much easier to hold than regular sandpaper. Then vacuum up all of the dust with a brush shop-vac attachment, and run the tack cloth over it again for good measure. We learned that it is much easier to get the desired coverage when you create a mostly solid white canvas for the final coat of paint. Really, the primer is your workhorse in this project (well, other than you, that is!). Repeat the steps above until you feel satisfied that the cabinets are white. Find a large flat area and repeat Steps 7-12 on your doors and drawer faces. 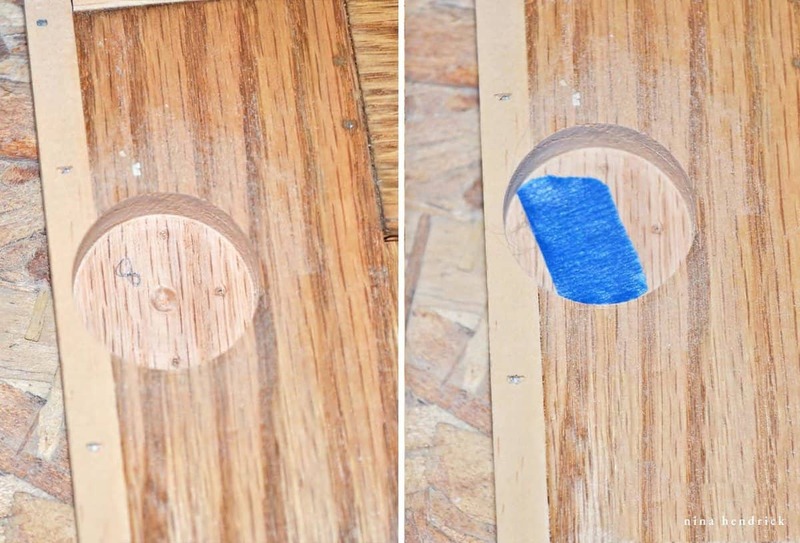 The sanding blocks I recommended are also for this step since an orbital sander won’t get into the door detail. While using your Drydex, I recommend using a smaller putty knife to get into the detail, if your door or drawer has routed areas. This is the step where the two optional items on the Materials List come into play- the air compressor and the Kilz Spray Primer. After sanding in between coats it is faster to spray the details with the air compressor to remove dust (rather than using a tack cloth). If you already happen to own one, it’s convenient- but it isn’t necessary to go out and buy one for this project. 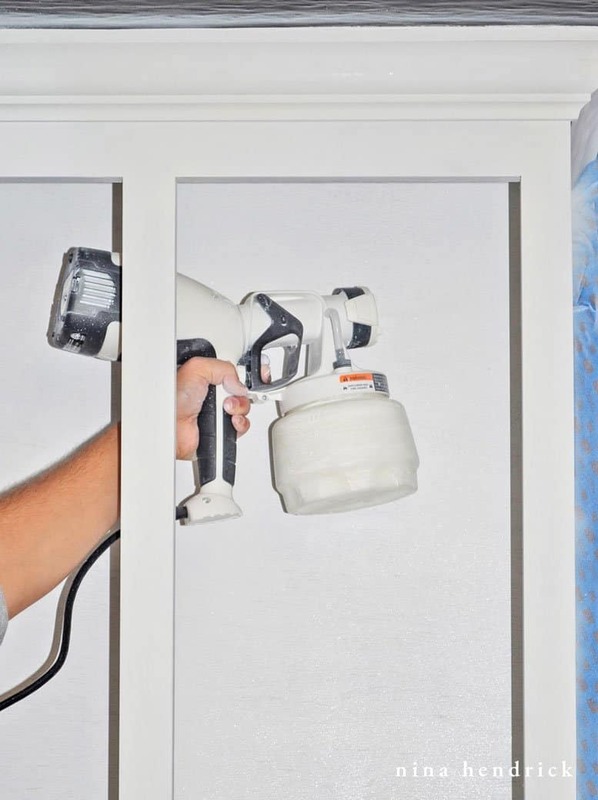 Additionally, if you have a space for spraying primer and proper ventilation, it is much quicker to use the cans of spray primer on your doors and drawers. We happened to have access to a professional spray booth, so we brought the drawers and doors there and sprayed the primer on. It definitely got the details better than a brush. It was so much faster, but more costly as we went through at least a dozen cans of spray. As with any project make sure you are wearing a safety mask when spraying with aerosol! Our biggest mistake when we did the project was that we saved this step for last. Five years later, the paint never yellowed, but the caulking has. Learn from us, make sure to caulk before doing the final coat of paint. As mentioned earlier, you will need to dilute the Cabinet Coat with distilled water. It’s best to follow the dilution instructions with your paint sprayer, but it may require even more tweaking. This is where your measuring cup comes in handy! Keep track of how much distilled water you’re adding. Once you figure out the correct dilution, make note of it so you can dilute the refills properly! Whatever you do, don’t immediately point your sprayer at the cabinets and begin spraying. Even after each refill, use a test board (we used an extra leftover piece of drywall) to make sure that your adjustment is correct on your paint sprayer. Important Tip: Paint small areas and tough angles first! An example of a tough area is the back of the face frame inside of the cabinet. It’s always easier to fill in a large flat area than to risk overcoating tough to reach spots. Remember, if you overcoat, that means you have to sand again. :) Those awkward angles also become even more difficult to paint if you’re avoiding already wet surfaces. The best technique is to move the sprayer continuously with smooth, long strokes. The nozzle of the sprayer can be rotated for horizontal or vertical strokes, depending on the direction of the surface you’re painting. We did two coats on the cabinet boxes, with plenty of drying time between. The doors must be set up in an upright position for spraying. We created a “spray booth” of sorts in our basement by putting a drop cloth over our workbench and putting a piece of scrap drywall behind it. We started with the backs and sprayed with the technique described above. After allowing for drying time, we sprayed the second coat. We then flipped the doors and repeated the process with two coats. We then repeated the process on the drawers, opting to paint both the outside and interior. Your cabinet doors and drawers may end up requiring more than two coats- but we feel that two is the minimum. After all of our priming, two coats were more than enough for us! After everything was dry, we rehung our doors and replaced our drawers. It was the moment of truth! I could have cried with happiness (but I’m a little dramatic). Should I Sand at the End? After the paint dries, I don’t really recommend sanding. I tried on a test piece, and it really dulled the paint and made it appear unfinished. If you really feel that you must, go with the highest grit possible. Did You Add a Top Coat? We did not. I leave the choice up to you. We did apply polyacrylic to the flat surfaces inside the cabinets to protect the shelves. I’ve never added a top coat to the cabinets faces and the finish is still undamaged 5 years later. How do you Clean Painted Cabinets? While we were working on the project a little bottle of lemon essential oil was left on a shelf. It sweated or leaked and ate through all of the finish, including the primer, and turned it into a gummy mess. What I took away from that: don’t use citrus cleaners on this finish! I recommend just wiping down with a slightly damp cloth as needed. Make sure to check the comments of this post below, as there are more questions answered! For more kitchen details visit this page! What an excellent tutorial! Were your cabinets oak? Mine are maple so maybe I wouldn’t have to worry so much about the grain? Thank you so much Elaine! Yes, my cabinets are oak. 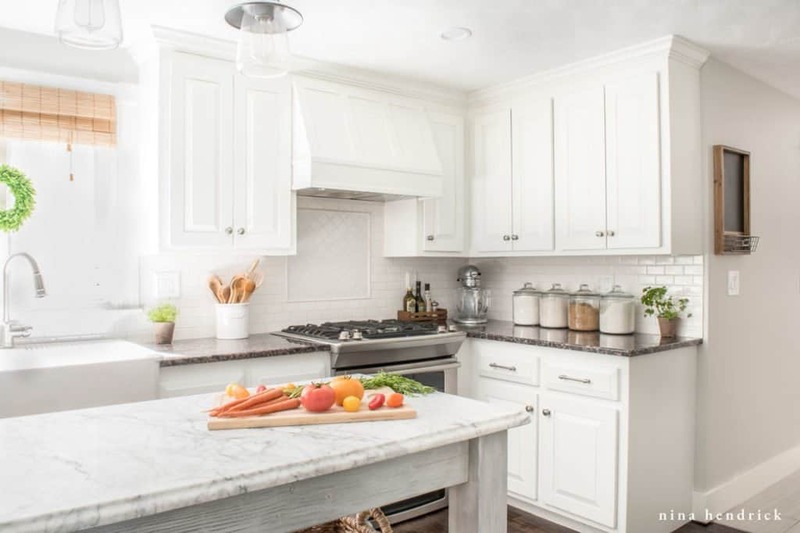 Maple is a very smooth wood and is generally what “designer” white cabinets are made from (Kraftmaid, etc.). Lucky you, you would get to skip the grain filler if you decided to do this process! :) If I had maple, I would still make sure to de-gloss, sand, and prime before spraying the cabinet coat. Thanks so much for all your info. Do you know f the Cabinet Coat yellows over time? I was told that BM Advance could. Deciding between the two. Also, how long was the curing time? Some say BM takes a few months. EEk! I have used both products. I prefer the Cabinet Coat for anything that you will be using as a surface (like a shelf), but the BM Advance does work very well for wall treatments and doors. In my particular experience, we didn’t experience yellowing with either product. The Cabinet Coat is especially bright white still! The curing time for the Cabinet Coat was fairly quick, it was only about a week. I would agree about BM Advance, it takes a long time to cure. I grew impatient and put things back on my office built-ins about a week after they were painted with BM Advance and things stuck and chipped the paint. I’m just wondering if you happened to try out the Benjamin Moore Advance paint that lots of people recommend to paint wood cabinets? They said it has a hard finish and is very self levelling? 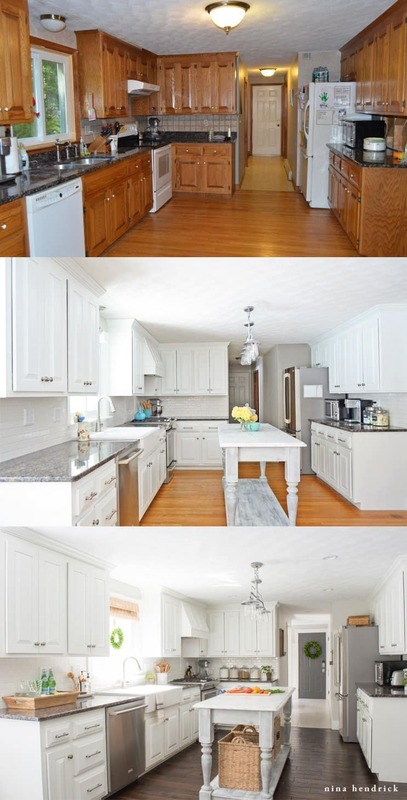 I have oak cabinets just like these and want to paint them soooo badly but everyone keeps saying I’ll hate the finished product because I’ll see the grain, but I love white and hate my dark oak cabinets! So this summer I hope to find myself painting cupboards! Thanks for all the tips! Your kitchen is awesome! Hi Lyndsay! I painted my office cabinets and built-ins with Benjamin Moore Advance. It’s true that it has a very hard finish, and it was self-levelling. Unfortunately, a year later it’s chipping. So I crossed it off my list of possibilities! But that is what I paint my trim with in the rest of my house, and I am very happy with it for trim! Beautiful! Can you share what you did about the hidden hinges for the cabinet doors? I would love to know about the hidden hinges as well. I just scheduled a painter to do our kitchen (after doing 2 bathrooms I have no desire to tackle the kitchen!) and I am researching hinges. I have been looking into Blum hinges, but am curious about yours. Thanks!!! Hi Theresa! Changing the hinges was a bit of a process. Our cabinets were partially inset with a 1/4″ lip. We had to first add a thin filler strip so that they would sit flush. Then we had to figure out the correct angle for our overlay before we ordered the hinges. We worked with Blum (http://www.blum.com/us/en/01/20/10/) and they had excellent customer service to help us figure out the particular angles and corresponding parts we would need! Our particular parts probably won’t be of use to you- there are thousands of combinations- but they will help you find the right ones based on your specific measurements. We ended up eventually ordering the Blum hinges from Amazon, as it was the best price. I’ve attached a photo link of the filler strip and recessed space that the hinge went in. As I said, it was a bit of work- but I think it really helped give the room a more professional look. I hope that helps! Nina, I wish to use this tutorial to paint unfinished oak media cabinets/bookcases. Since I am starting with smooth, unfinished oak, do I need to do anything different, or start with the Dryex and follow the steps as shown? Nina, you may be one of the few who can answer this question: We also want to paint our oak kitchen cabinets which are similar to yours, but rather than a rectangular shaped inlay, they are that awful cathedral style inlay. I would rather have a plain flat panel than to see that awful arch (especially on the more narrow cabinets). In all your research, what product could I use to completely fill those deep crevices made by the arch shape? I have heard really great things about Epoxy Wood Filler, although I’ve never personally used it. I remember seeing a blog post where a whole missing furniture leg was sculpted out of it! I can’t remember the post, but it sounds like it may be something worth looking into. I hope that helps! I was wondering if you had made a decision about what sealant you are going to use. Hi! We’re actually going to leave just the Cabinet Coat, for the time being. It’s holding up very well, and is extremely easy to clean! Thanks for the detailed tutorial! We are getting started in two days on the kitchen in the home we just bought (it has the ugly grainy oak too). We have two weeks to do it – hoping that is enough time!! I am printing out your post to help guide me! I’m so sorry I missed this- I want to make sure the answer is here for future reference- the Cabinet Coat takes about a week to cure! I hope you love your kitchen, Jill! Did you ever decide on a sealant? We just finished my craft room and are looking to move to the kitchen next. We used Polycrylic on my desk top, but it has a tacky feeling to it, and I’ve already pulled up the paint in several places because my machinery will stick to the desk. It’s been a few months since we’ve applied the Polycrylic. If you used it on your kitchen cabinets, have you had this issue? Hi Jessica! I actually decided to leave the Cabinet Coat as is- no poly or any other kind of sealant. 6 months later there is no chipping whatsoever, even where the drawers and cabinet doors bump the cabinets. And that’s with two young kids slamming things shut all of the time :) I have been so impressed with the Cabinet Coat! Did I miss how long this took? That is vital information to be used to convince my husband! From the day you actually started taking things apart to rehanging the cabinets, how long did this take? THANKS! Hi Amy! It really depends on the size of your kitchen and the pace you choose to work. We did it in phases, during weekends, and took some breaks when it got overwhelming. It took us 4 months. If you wanted to get it done all at once, it could be done in a week straight (assuming the kitchen is the same size as ours!). I know that sounds like a ton of time- but I would personally do it again in a heartbeat! I think ours is about the same size and layout as yours. I just love how yours turned out! 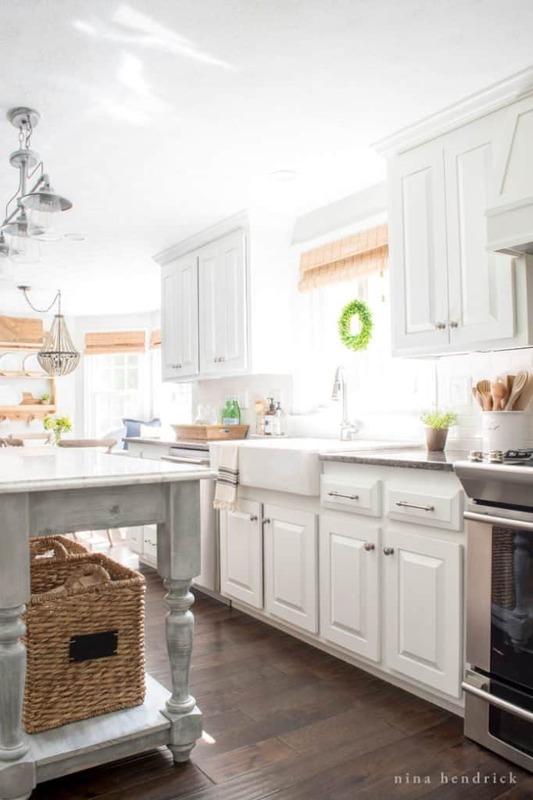 I am thinking about tackling just the kitchen island first because I think that would be cute white either way. Then I can get a little taste for how it will go and make my mistakes on the parts that don’t show. :-) Thanks for the detailed tutorial!! That really helps me see how it will REALLY go. I am in favor of kicking my family out for a week and going for it! Ha! How wide is your kitchen? Thanks! Hi Nina! I noticed when you put the new backsplash in you removed the granite edge piece that went up the wall (I am not sure what it is called) when u removed it was the granite underneath ruined at all? I would like to remove mine as well so the backsplash goes all the way Down to the counter top like yours does now. Thanks! Hi Colleen! I apologize for being so late to answer, I took a step back from the blog when my daughter was born last winter. This is a really great question! Our countertop was not damaged by removing the matching strip of backsplash, but there was silicone adhesive left behind that we carefully scraped off. Also, a word of caution- in our bathroom the backsplash strip was used to hide a very uneven gap between the countertop and wall. If you discovered something like that, I would recommend installing a thin piece of white trim around the perimeter to cover the gap before you begin your tile. Hi Nina. We’re bored of our lovely solid oak kitchen. Of course not all of the wood is actually solid oak e.g. Cornicing and plinth covers at floor level. You can see that when you contrast the naturally ageing oak. So the question is how does the veneer look when painted? Our kitchen was all solid oak, no veneers, so unfortunately I didn’t research how veneer looks when it’s painted. Sorry I couldn’t be of more help! Hi! I am so thankful for this blog. my husband and I have just spent the last 2 months painting our kitchen cabinets. The boxes are done and look great but the doors (which we just finished today) look awful. We barely survived the first attempt and now we are facing it again. :( I read your blog and I felt like all of our issues were covered here. The black grain shows through and we have the orange peel look. We have the same paint sprayer and we trade a sanding sealer that was recommended on another blog. We are going to sand everything off and try the drydex but i’m a little nervous about mixing the paint to avoid the orange peel look. Can you help me? Hi Alicia! We found it was best to add the water in slowly in order to thin the Cabinet Coat. For example, try adding in 2% dilution first, then test it and see if there’s orange peel- if so, adjust the sprayer and a another 2% of water. Build your way up until you achieve the correct consistency without orange peel and without over-thinning. I hope that helps and good luck!! Beautiful job! What did you have to do to your base cabinet to make it ready for the farmhouse sink? Hi Kelly- Thank you! We have all of the details about our Farmhouse Sink here! We are currently in the process of sanding our cabinets and we just aren’t sure how sanded they have to be? Do they just need a light sanding or are you bringing them back to an unfinished wood? I’ve been a little picky and have sanded some of them right back to natural (with the exception of a few spots that you just can’t really get that well), but am just not sure if that’s necessary. We basically brought them back to unfinished wood! That was the only way to open up the grain for the Drydex. Basically you have to open up the grain in order to eventually fill it in. I hope that makes sense! mount sink with a farm sink, and you had to cut your cabinet down. Can you tell me how you went about that??? How did you measure for your sink? I currently have granite but with a cheap drop in sink. Hi Michele- Thank you! We have all of the details about our Farmhouse Sink here!